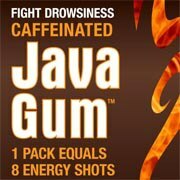 Try Java Gum! This great tasting gum—available in peppermint and spearmint—fights drowsiness as effectively as a 10-oz. cup of coffee, but leaves breath minty-fresh. A single pack of gum (8 pieces) costs less than an eighth of the average cost of energy drinks, works up to five times faster, and yields a higher profit. 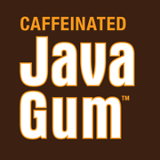 Each piece of Java Gum packs 65 milligrams of caffeine and is both sugar and gluten free. Whether you are a mom on the go, a nurse working a long shift, a student trying to pull an all-nighter or a construction worker who doesn't have time to grab a cup of coffee, Java Gum supplies an instant boost that’ll fit any active lifestyle. I tried the gum out on a short run as the gentleman I talked to said that the gum lasts for about 45 minutes. In it went, I decided to try the spearmint flavor. Tasted good, no coffee taste to it. The package says to chew one piece by mouth for moderate effect, two pieces for full strength effect. I decided since it was 8PM that I would stick to one piece of gum. I got through an easy 4 and felt good. I was still energized when I finished my run but was not kept up all night as I would be if I drank a cup of coffee at that time in the evening. Now for the giveaway. I'm giving away one pack of Java Gum, peppermint flavor. I only drink coffee 1-2 a week. My vice lately has been energy drinks instead. This stuff is awesome. I like to use it before I hit the gym. Supercharges my heavy lifts! I'm a Diet Coke drinker. I don't really drink coffee.